Thailand is a big country and you can easily cover quite a lot of ground on a 2 week Thailand itinerary. There are beaches, temples, historic sites and rising mountains worth discovering. 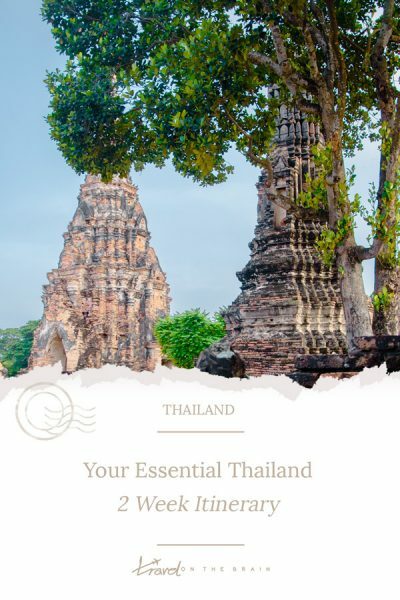 If you need some pointers of where to start, here is my Thailand 2 week itinerary. Bangkok is both great for a short layover as well as a longer stay. You can easily fill your days in Bangkok. 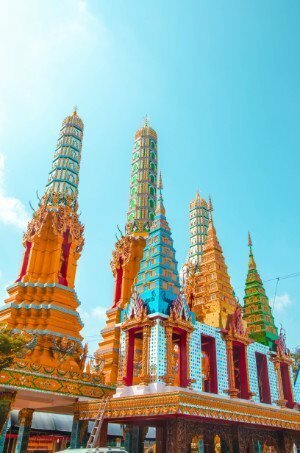 In its centre, there are major Bangkok tourist attractions, such as the Giant Lying Buddha, the Royal Palace and various temples. I recommend using the river commuting boats to travel along the river shores. It’s super affordable if you don’t accidentally book the tourist boat tours. You can easily include visits to various markets, such as the flower and fresh food market or book a day trip to the famous floating markets a little outside of Bangkok. It’s possible to get there by yourself with public transport but quite the hassle. One of my favourite spots in Bangkok – albeit super crowded and touristy as well – is Chatuchak Market. You can buy all kinds of things here on the weekend, such as street food, clothing, souvenirs, even furniture and pets! 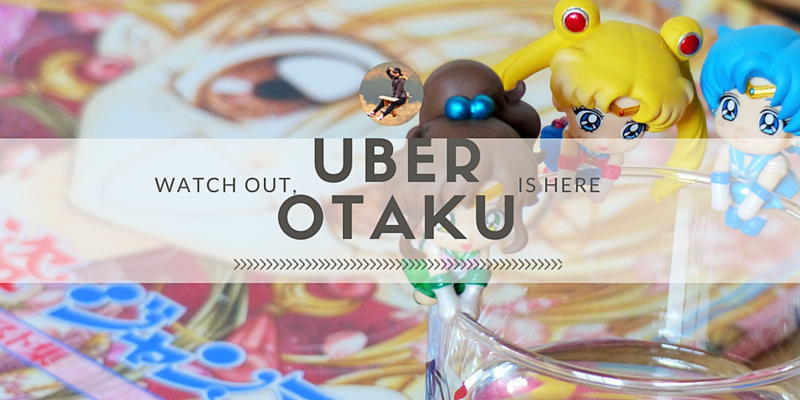 It’s easy to get overwhelmed, so I’ve put together a quick Chatuchak Market Guide. You’ve probably seen the famous stone head in the tree? That’s in Ayutthaya. In fact, the entire town is more like a playground for archaeologists as there are so many temples and ruins all over! 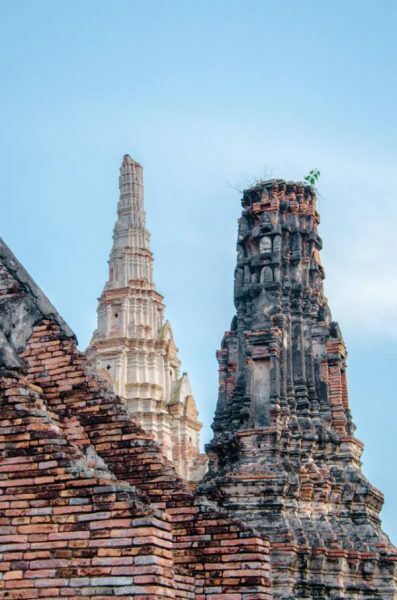 You can go on a day tour to Ayutthaya and be guided by a local and introduced to the fascinating history and cultural significance of the place. Or you can take hire a taxi driver to take you to the main places if you want to DIY everything. I personally decided to stay overnight so I could catch both sunset and sunrise as well as the night markets in Ayutthaya. There seriously is so much to see that a day just won’t cut it. However, if you only have a week in Thailand and want to cover a lot of ground, a day is a good start. If you hadn’t had the chance yet to visit floating markets in Bangkok, you can take advantage of the Ayutthaya floating market. It’s very touristy but a good introduction to floating markets and Thai culture. In the northernmost part of Thailand, at the border to Myanmar, you can find the Golden Triangle. 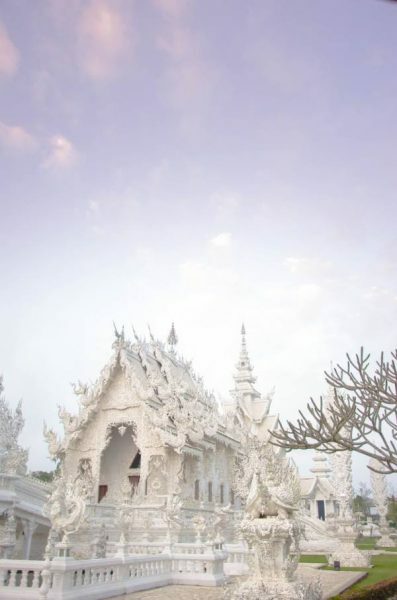 This includes Chiang Rai with its White and Blue Temples, the Karen hill tribes and the border crossing. It’s hard to do it all in one day and especially by yourself as the area is quite vast. There are local and super affordable buses operating so you could technically see all of Chiang Mai and then some. But that’s a lot of hassle. So if you are keen to explore the Golden Triangle, it’s best to book a local guided tour, such as the 4 Days Chiang Mai to Chiang Rai . Chiang Mai in itself is worth spending one to two days in. The Old Town in Chiang Mai boasts a multitude of impressive temples and if you time it right, you can visit the Buddhist monk office hours. This means you get to chat with a monk and they get to practice their English. For free! 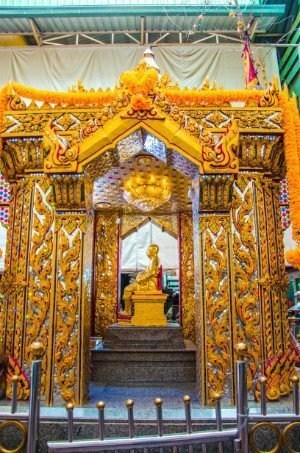 A must see in Chiang Mai is Doi Suthep mountain with the temple. You can hike Doi Suthep or take a local taxi from the entrance of the Chiang Mai zoo. They will take you as far as the village and palace on the mountain as well. 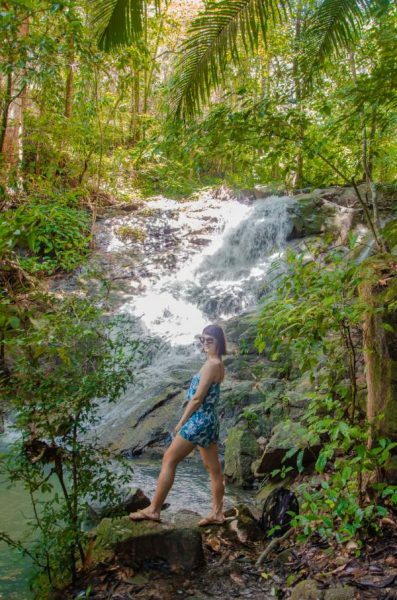 In case that isn’t enough, plan a day trip out to the sticky waterfall and Doi Inthanon. Again, you can only get there by a mix of public buses and local taxis, making day trips quite long and tedious. Again, it’s better to rent a car or jump on tour. Those are very affordable anyway. You can check rates and reserve a seat in advance here because they are rather popular. Udon Thani isn’t on many 2 week Thailand itineraries. It ought to be! Flights from Chiang Mai to Udon Thani are quite cheap with Nook Air. The city itself isn’t incredibly fascinating though its markets are nice. What makes it such a hotspot though, is the famous Red Lotus Lake, which blossoms in winter. You might have seen the mesmerising photos of a blue lake entirely covered in vivid pink lotus flowers. That isn’t photoshopped and actually looks even cooler in real life! It’s basically like a Thai Stonehenge only the meaning and origin of the stone paintings and alignments haven’t been 100% deciphered yet. If you want to experience the incredible once-in-a-lifetime experience of the lotus lake (which really is as stunning as the photos look), check out this tour. Thailand isn’t only known for its tropical forests and rugged mountains up North. Its beaches and islands are the main tourist magnet – for a good reason! A super popular island is Phuket and you can catch an hour long flight from Bangkok to it. It’s possible to see a good chunk of Phuket in one day by renting a scooter or joining a tour. You can see a string of white sand beaches in the West, such as Patong, Karon and Kata Beach. Then, there is also the Big Buddha statue high up on the mountain. 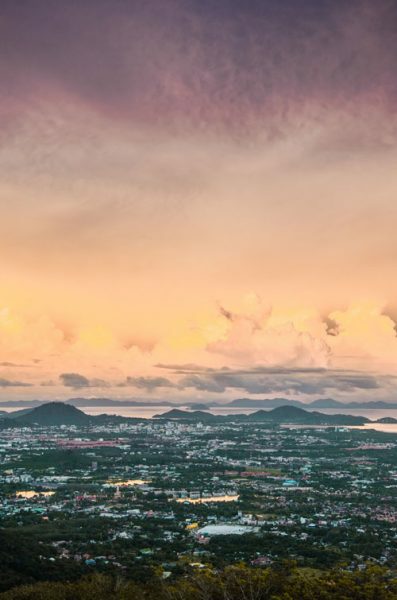 You can look as far as Phuket city from there! From Phuket, you can also easily go on day trips to other islands, such as James Bond island, Koh Samui, Ko Yao Yai or even Ko Phi Phi. There are multiple ferries leaving daily from Phuket City. Of course, there are also tours that will squeeze in quite a lot of Thai islands and scenic hotspots. A lesser known but even more beautiful beach area is Krabi, in the West of Thailand. It is ideal for those seeking to enjoy nature fully and who don’t care much about the party element. Imagine pristine white beaches, winding rivers and beautiful mountains. Since you only have two weeks in Thailand, it’s paramount that you maximize your time in each Thailand holiday destination and not waste it getting from A to B. One way to ensure this is to fly everywhere as that saves you quite a lot of travel time. Sure, you can take trains or buses around the mainland but that can take the better half of a day. It’s crazy affordable too if you pick the right time and don’t care about what compartment you’re sitting in. Flying within Thailand isn’t too expensive either if you love to do your own trip and travel planning like I do. Taxis to and from the airports are affordable as well. Download the Grab app for the best deals and to know prices in advance. (If you have your own portable wifi hotspot, you can access it wherever you are in your Thailand itinerary.) You don’t want to be ripped off by cheeky drivers. Also, consider joining small group tours. 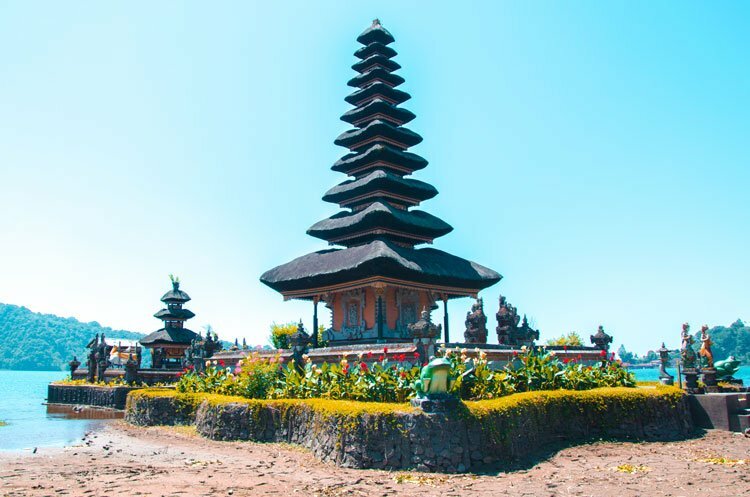 I personally used them when I want to cover quite a lot of ground, mingle with fellow travellers (particularly important as a constant solo traveller) and hear more background stories and historical facts from local guides. 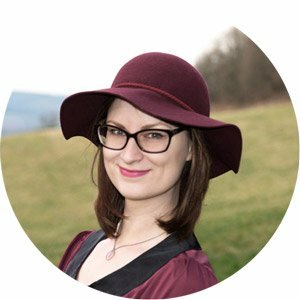 What to Pack for 2 Weeks in Thailand? It’s definitely worth it to check what the climate will be like. Generally though, Thailand enjoys warm tropical weather. This means, you need to pack appropriately. Think sundresses, swimwear, floaty dresses, sunhats and sunglasses. A must are sunscreen and tanning lotion. They are more expensive than in Western countries, so you should bring them with you. If you want to go swimming in nature while wearing sunscreen, I recommend investing in a biodegradable one to not pollute the environment. Insect repellent is crucial as well but can be had in any convenience store. You can buy that one site. If you are prone to insect bites, wearing long but lose clothing is a good idea as well. Plus, get a sarong so you can enter temples. It’s not possible everywhere to borrow one at the entrance. Should you be travelling throughout winter, be prepared for rainy days. A sturdy poncho goes a long way. The flimsy plastic ones will easily break and are just too light on windy days. Read the full list of what to pack for tropical holidays here. 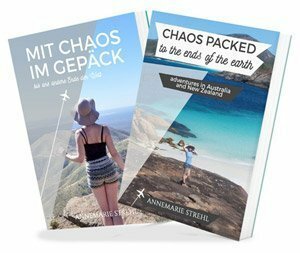 Is a Thailand 2 Week Itinerary Enough? Thailand is vast! So basically the answer is no. BUT! If you don’t have a lot of holiday days to spare, want to get a good overview of the island. Two weeks in Thailand are a decent start. The key is to not drift around but have a set Thailand travel itinerary in place so you know where to go and not miss out. I hope my 2 week Thailand itinerary was helpful. 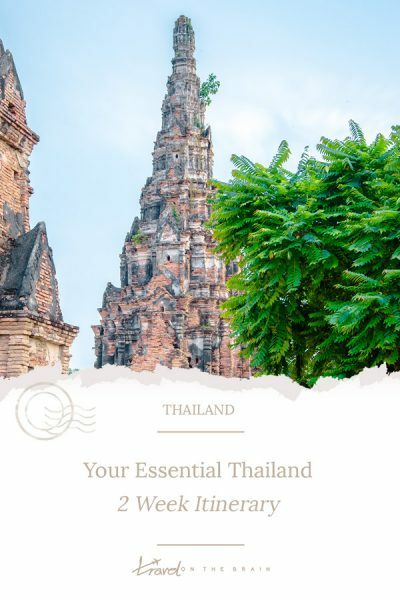 Let me know if you have any more questions and feel free to check out my other more indepth Thailand guides on local places, such as the airplane graveyard in Bangkok or best cafes in Chiang Mai. 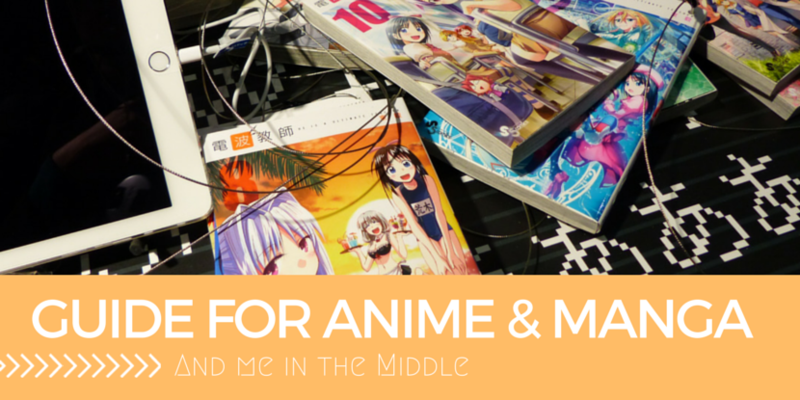 I even have a video series in Thailand. Tell me: Have you travelled Thailand before and where would you like to visit most?